U.S. and coalition air forces picked up the pace against ISIS this weekend, with 42 airstrikes reported on Saturday. Near Abu Kamal, one strike struck an ISIL crude oil collection point. Near Al Hasakah, four strikes struck three separate ISIL tactical units and destroyed an ISIL building, an ISIL car bomb, and four ISIL vehicles. Near Al Hawl, two strikes struck two separate ISIL tactical units. Near Ar Raqqah, one strike struck an ISIL tactical unit and destroyed an ISIL checkpoint. Near Dayr Ar Zawr, one strike struck an ISIL tactical unit and destroyed two ISIL vehicles. Near Mar’a, 13 strikes struck 12 separate ISIL tactical units and an ISIL headquarters, destroying four ISIL fighting positions, three ISIL buildings, an ISIL heavy machine gun, an ISIL staging area, damaged an ISIL fighting position and an ISIL building, and wounded an ISIL fighter. Near Albu Hayat, one strike struck a large ISIL tactical unit and destroyed three ISIL buildings. Near Bayji, one strike destroyed an ISIL tactical vehicle. Near Kisik, three strikes struck an ISIL tactical unit and destroyed an ISIL fighting position, an ISIL vehicle, and suppressed an ISIL mortar position. Near Mosul, four strikes struck three separate ISIL tactical units and destroyed five ISIL fighting positions, three ISIL heavy machine guns, an ISIL bunker, and an ISIL vehicle. Near Qayyarah, one strike struck an ISIL tactical unit and destroyed an ISIL weapons cache and three ISIL fighting positions. Near Ramadi, six strikes struck three separate ISIL tactical units and destroyed an ISIL command and control facility, 15 ISIL fighting positions, two ISIL buildings, five ISIL heavy machine guns, an ISIL recoilless rifle, an ISIL mortar system, an ISIL IED facility, an ISIL resupply warehouse, and denied ISIL access to terrain. Near Sinjar, two strikes struck two separate ISIL tactical units and destroyed an ISIL heavy machine gun, an ISIL fighting position, and an ISIL checkpoint. Near Sultan Abdallah, two strikes struck a large ISIL tactical unit and destroyed two ISIL assembly areas. The Pentagon defines a strike as “one or more kinetic events that occur in roughly the same geographic location to produce a single, sometimes cumulative, effect for that location.” That means a single aircraft delivering a single weapon is one strike, as are multiple aircraft firing dozens of weapons at a single target. 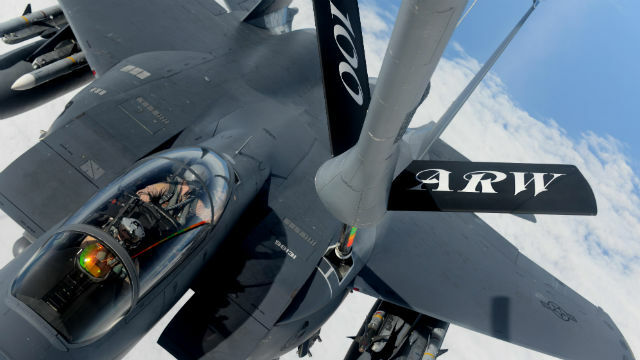 The strikes were conducted as part of Operation Inherent Resolve, the operation to eliminate ISIS and the threat it poses to Iraq, Syria, and the wider international community.